To compliment our extensive range of wax stamps we have an extensive range of colours too. We are pretty sure that there will be a colour for your need. Our sealing wax comes in 3 different forms – with wick, flexi and flexi mini. 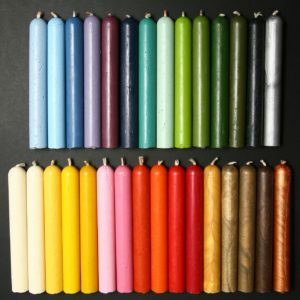 The sealing wax with a wick is ideal for doing small amounts at a time. You light the wick, the wax falls in the area you want it and then stamp it with your stamp of course. Full instruction are available here. 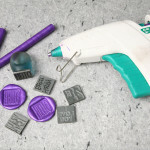 Flexi sealing wax is for use in a glue gun and better when doing a larger amount of stamps. like wedding invitation, certificate, etc. The mini flexi sealing wax works the same and is for the smaller hobby glue guns. Full instruction are available here. View the full colour chart here. Some history on sealing wax: it is a wax material of a seal which, after melting, hardens quickly (to paper, parchment, ribbons and wire, and other material) forming a bond that is difficult to separate without noticeable tampering. Wax is used to verify something such as a document is unopened, to verify the sender’s identity, for example with a signet ring, and as decoration. Sealing wax can be used to take impressions of other seals. Wax was used to seal letters close and later, from about the 16th century, envelopes. Before sealing wax, the Romans used bitumen for this purpose.